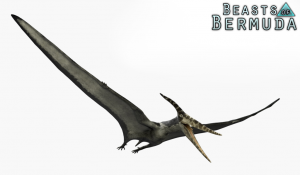 The Pteranodon is a playable flying creature in Beasts of Bermuda. It is the fastest and most mobile creature in the game, able to soar through the skies at incredible speeds. This lets it able to access areas no other creature can reach, such as isolated landmasses and steep, high mountain peaks. However it must be careful occupying these locations in certain weather conditions, as it is extremely vulnerable to lightning strikes and windstorms. During these events, the Pteranodon must take refuge in a sheltered location. As for its diet, the Pteranodon is piscivorous. It will often plunge into the ocean to catch fish - but it's not limited to eating just fish. It can become a scavenger, feasting on decaying meat if enough Scavenger points are put into its Ability Tree, as well as being able to kill other creatures by launching a deadly aerial assault from the sky. With its greatly adjustable diet, ability to fly and fast growth time, the Pteranodon has a high chance of successfully reaching its adult stage... provided it doesn't crash into anything! Primary Attack: A fast bite. The damage is based on how fast the Pteranodon is moving, with higher speeds totalling more bite damage, and slower speeds dealing very weak damage. Secondary Attack: Same as the Primary Attack, except it makes the Pteranodon bite downwards instead of forwards. Unique Attribute: The Pteranodon can use its short call (Default button is 2) to briefly highlight all nearby fish, making them much easier to spot. If the Pteranodon crashes into a tree, rock, hillside, or by any terrestrial animal while flying, it will be knocked out of the sky and slam to the ground. It will likely die from such fall damage. However, if alive, it is susceptible to being found and preyed upon by carnivores who have detected its scent. The Pteranodon is also susceptible to harsh weather due to its very poor weather resistance stat. Not even Ability Tree investments in weather resistance will completely solve this problem. It is forced to take refuge from even mild storms. The Pteranodon's flight mechanics were inspired by the Pteranodon of Primal Carnage: a combat game where humans and dinosaurs do battle. The Pteranodon's current look is not finalised! The Pteranodon model shown at the top of this page will replace the current model sometime soon. Its current sounds are not finalized either. This page was last edited on 18 March 2019, at 01:38.